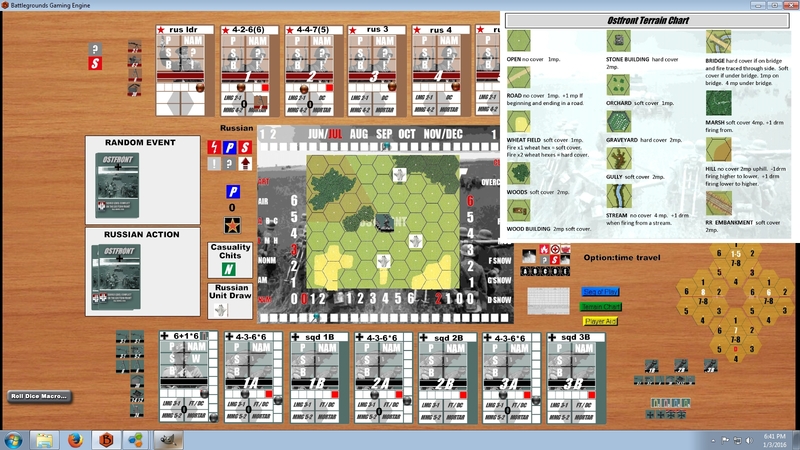 This is a BGE conversion of the “Ostfront” boardgame, by Jason M. Kruse (published as a print-and-play game by H&S Ganes in 2015). The digital conversion of this game was created by Randy Bickel (aka rab46) and is being released with permission from the game designer. However, in order to be able to play with this digital version, you must own a copy of the original game, as the rulebook PDF is not included in this release. Ostfront is a solitaire WW2 tactical infantry wargame in which you and your squads will have to “hit the ground running” as each engagement finds your platoon literally immersed in the center of an already unfolding situation. As a German platoon leader you will fight your way across Russia in a tactical tour de force. Each month you will take part in engagements against a random number of Soviet squads and accumulate victory points which facilitate promotion, unit upgrades and awards. The game is simultaneously a construction kit that allows you the option to create your own maps,scenarios and troops. The above download contains everything needed to play the game if you already own the original game and if you already have a BGE Gamer Client license (v1.7 or higher), or a subscription to BGE. PS: If anyone is interested in buying the print-and-play game, it is available from the H&S Games website for $19.99. It occurs to me that there may be gamers out there who are averse to the crafting involved in a PNP game, but still want to play Ostfront. Now they have the means to do so on their computer.